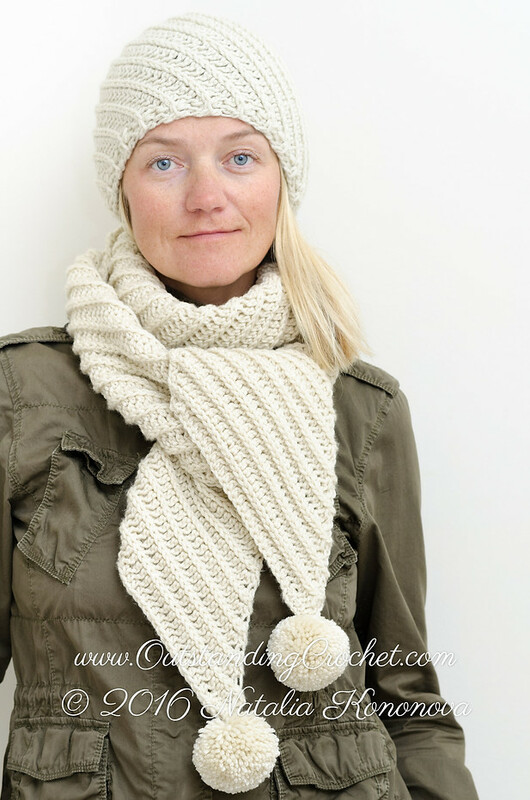 Outstanding Crochet: New - Bias Rib Pom-Pom Hat & Scarf Crochet Pattern. New - Bias Rib Pom-Pom Hat & Scarf Crochet Pattern. Hat sizes are from Newborn to Adult Man. Pattern includes step-by-step pictures for the stitch and pom-pom making, written instructions and crochet chart. This is Beginner level pattern, but everybody will enjoy it. Such a fast project thanks to worsted weight yarn and hdc stitch. Check out Bias Rib Pom-Pom Hat & Scarf Crochet Pattern (clickable link). It's a wonderful set! I like the stitch pattern.